More than just a grocery store, the Albertsons on Broadway has just about anything you you can think of wanting for game day. Being right down the street from the stadium, you’re in prime location to feel like you are a part of all the action. ”Eat Life up” is the motto, and Albertsons doesn’t stop short of making sure you have the ultimate setup to make you feel that you are tailgating the right way. Albertsons plans to show their sense of community and make the first Boise State home football game of the season one to remember. Events leading up to the game will be sure to bring the spirit. Partnering with local businesses like RR Ranch and Payette Brewing for this upcoming game day, your hearts and bellies won’t be upset. You can enjoy excellent beer and food while hanging out with other BSU fans, before walking over to the game. And don’t worry if you weren’t able to get tickets to the game, because when it comes time to watch, their bar Broadway on the Rocks is fully stocked with 36 beers on tap, wine, liquor and has 12 flat screen TV’s for a premium viewing experience so you won’t miss a beat. Having your own tailgate or viewing party? Albertsons has just what you need. The freshest produce, an artisan bakery, a variety of delicious cheeses, well prepared meats, and an endless supply of craft beer and wine, you can have your very own spread that will be sure to impress. Keeping it Local - From local farmers to local companies, there are plenty of products highlighted throughout the store to keep things current. International - Those special items you can’t seem to find anywhere else, look no further. Deli Style - With the vast selection of meats and cheeses, and made-in-house products, you can’t go wrong. Broadway on the Rocks - A casual dining experience located in the top level of the store, with a extra-long happy hour everyday from 3 p.m.-7 p.m., your grocery shopping experience just got more fun. Artisan Bakery - Made from scratch pastries, bread, desserts and so much more, you won’t leave empty handed. Fan Zone - Get your primo BSU gear for game time! Everyday Needs - Living well, get what you need with recognizable household brands for your one-stop shopping. 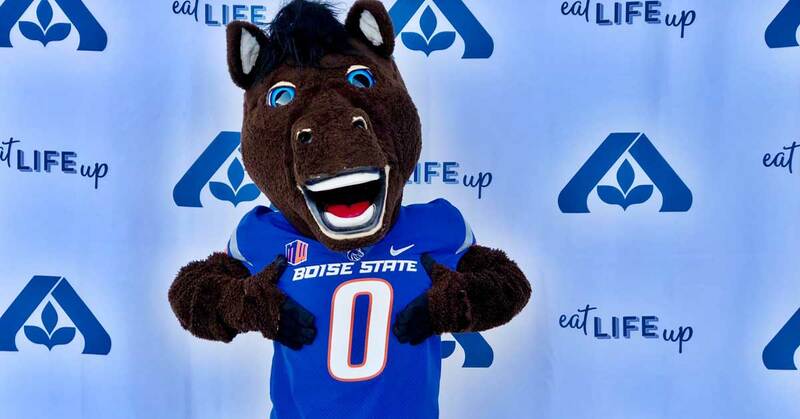 Albertsons on Broadway wants you to #EatLifeUp,” so join them this upcoming game day for your pregame festivities and GO, FIGHT, BSU! Stop dissing potatoes and embrace the tater! Here are 5 fun reasons why Boise loves potatoes.